A classy summing mixer for Fat Bustard fans and beyond whom enjoy greater clarity and less noise. Ability to sum signals while adding character. Attitude knob. Musical EQ. When it comes to creating a stereo mix of your production, there are those who will happily mix 'in the box', doing everything digitally on the computer, and those who will swear by breaking out into the analogue domain, putting individual tracks or stems through a hardware device that will sum them to stereo. The Thermionic Culture Green Bustard II is a product for the latter group. 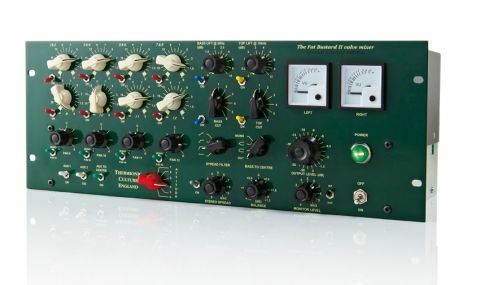 A 14-channel all-valve passive summing mixer, the 'Bustard II not only combines those analogue channels into a single stereo channel but also features a nice range of facilities to tweak the audio and make the most of that mix. This version of the (normally black) Fat Bustard II is finished in British racing green and is a limited edition model produced in response to a customer who wanted less colouration and lower distortion than the stock version. "A big presence in your studio, the Bustard is a rack-mounting unit taking up four standard rackmount spaces"
A big presence in your studio, the Bustard is a rack-mounting unit taking up four standard rackmount spaces (be aware that if you place it in a rack, it will need an extra space above to allow for ventilation of the valves). Construction is of the highest quality and the control layout neat and intuitive. All of the unit's inputs are via XLRs and the 14 channels are made up of four stereo pairs (channels 1-8), four mono channels (9-12) and a pair of auxiliary inputs that can be used as a further two inputs to be summed or as an interface to add the 16-channel Little Bustard, extending the number of input channels to be summed. Channels 1-8 are each equipped with a detented chicken head knob rotary fader and on/off switch, while the mono channels have a centre-detented pan pot each plus a Mono switch that alternatively sends the signal to the stereo centre with an extra 3dB of gain. The Aux channels have an on/off switch with Aux 1 being panned hard left and Aux 2 hard right, unless you engage an Aux To Centre switch. The main output, through XLRs, is controlled via a high-quality Elma rotary switch. You also get a monitor output on 1/4" jacks with a level knob. Another pair of jacks enables connection of an external source to be monitored. A switch next to the monitor level knob lets you choose between the two sources, which is ideal for comparing the mix as it exits the Fat Bustard against playback from the equipment that records the master. The Fat Bustard EQ comprises of switches providing six different options each for Bass Cut (three high pass filters, three shelving) and Top Cut (three low pass filters, three shelving). Elsewere, rotary knobs offer Bass Lift and Top Lift utilising varislope EQ curves: the Bass lift curve starts to rise a 2kHz at low settings, peaking at 50Hz at high settings; the Top Lift starting to rise at 800Hz, peaking at 10kHz. "￼￼￼This is one classy-sounding EQ. Just using the Top Lift in isolation adds a rather lovely top end sheen"
This is one classy-sounding EQ. Just using the Top Lift in isolation adds a rather lovely top end sheen, and once you get the feel of it there's a lot you can do by using those Lift and Cut controls in conjunction - selecting a bass cut then dialling in a bass lift at a lower frequency means you're able to scoop out some mids. A further four knobs affect the width of the stereo with respect to frequency. The Stereo Spread knob increases the apparent width of the stereo for a specified range of frequencies chosen from the four-position Spread Filter switch. You can spread at full bandwidth or above 100Hz, 250Hz or 3kHz - subtle use of this opens up a mix nicely. While you can effectively spread out the top end, at the other end of the spectrum you can tighten things up and get heavier with the Bass To ￼￼￼Centre control that puts a range of frequencies to mono so that you can choose frequencies below 100Hz, 200Hz, or all frequencies. Besides this, there is a Balance control to correct any left/right balance discrepancies caused by a connected outboard. One chicken head knob stands out on the front panel, lighting-up red and bearing the name Attitude so you know it means business! This function offers six settings of increasing gain and harmonic content running from -2dB up to +12dB in position 6. This is where you can take full advantage of the extra fat quality coming from those valves cooking away inside the chassis, with an increasing degree of characterful richness as you progress throughout the settings. How this works for you will depend upon your program material, but we liked the enhancement of the lower settings when mixing a whole song down to stereo and found the higher numbers, where things can get a little crunchier, to be useful when the unit is used to process certain individual instruments and submixes. In this role, we got great results sticking a drumkit through it, using the Attitude knob for some extra punch. The Green Fat Bustard II can do great things to your mix and is ideal to have around as a sonic processor at all stages of recording. Obviously at that price it's not something all of us could seriously consider buying. But for pros with the necessary income and well-heeled amateurs who really care about getting the most out of their music, the benefits could make it a worthy investment.